The earliest stages of our Pluto encounter have begun, and New Horizons remains healthy and on course. Already, the SWAP, PEPSSI and SDC instruments are taking daily science data — measuring the charged particle and dust environment of the space near Pluto’s orbit. Next week, on Jan. 25, the sensitive LORRI long focal length camera aboard New Horizons will begin imaging the Pluto system for navigation purposes. This will yield dozens of images that our navigation teams will analyze for positional information about Pluto and Charon against star fields, allowing us to home in more accurately than by radio navigation from Earth alone. But while New Horizons approaches the Pluto system ever more closely, there is a little time left to write about what’s in store, so let’s begin. In this update, I’m going to preview the atmospheric science we’ll do during the flyby. Next time, I’ll preview the surface geology and composition measurements we’re planning. But first I want to give you the basics of what we know about Pluto’s atmosphere, and Charon’s. 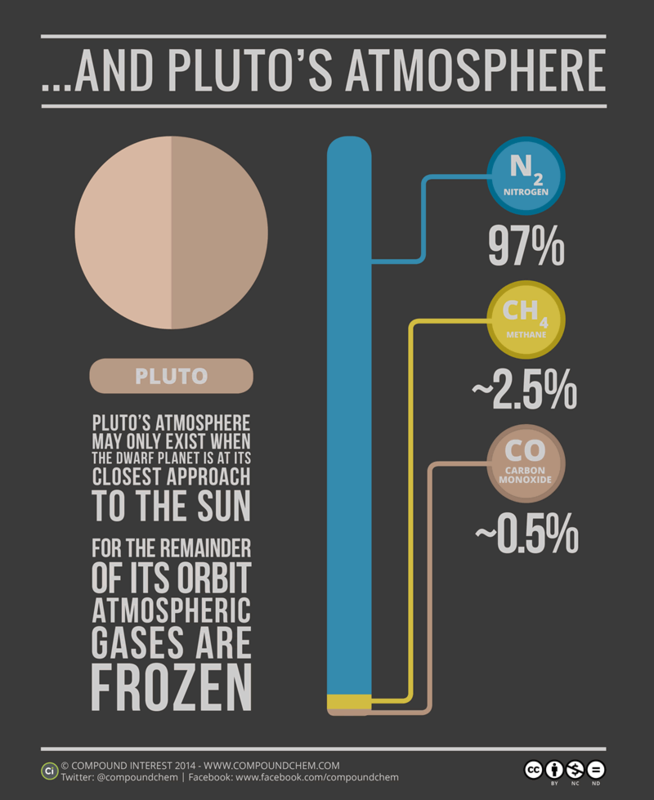 Pluto’s atmosphere is composed primarily of nitrogen, just like Earth’s atmosphere. But its minor gases aren’t oxygen and argon – as on Earth – they are carbon monoxide and methane; other gases may also be present. Pluto’s atmospheric pressure is about the same as that in the Earth’s mesosphere, about 30 to 50 miles above the ground. Its atmosphere is known to display a mild greenhouse effect, as well as winds and, very likely, some hazes. There may even be clouds. We also know that Pluto’s atmosphere is rapidly escaping, much like the way the early Earth’s atmosphere escaped, in a process called hydrodynamic escape. This happens when molecules high in the atmosphere are hot enough to simply flow away, a little like a cup of water filled up from the bottom and brimming over the rim. As for Charon: it’s been speculated that this world, Pluto’s largest moon may, have an atmosphere. Perhaps it was captured (siphoned) off Pluto or created by internal activity or a recent cometary impact. But whatever (if anything) is there, it’s been too thin to find from Earth. New Horizons will attempt to do better. Determine how Pluto’s atmospheric pressure and temperature vary from the surface to high altitude. Determine the atmosphere’s complete composition. Measure the atmospheric escape rate. Determine if Pluto has an ionosphere. Determine how Pluto’s atmosphere varies from place to place, and with seasons and time of day. Search for an atmosphere at Charon. REX is our radio science experiment. On closest-approach day — July 14 — REX will intercept a set of four 20-kilowatt beams of radio energy sent to Pluto by giant 70-meter-wide antennas in NASA’s Deep Space Network. By measuring how these radio beams refract (or bend) through Pluto’s atmosphere, REX can help us determine the base pressure and temperature of Pluto’s atmosphere, as well as how those quantities vary with altitude above Pluto’s surface. REX can also determine another atmospheric quantity: the density of ionospheric layers high over Pluto. 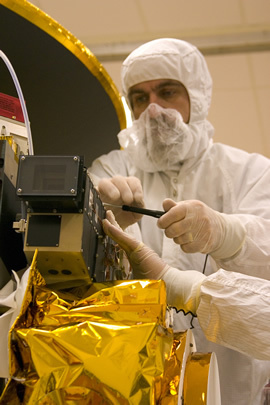 PEPSSI, which stands for Pluto Energetic Particle Spectrometer Science Investigation, measures high-energy ions that originate in Pluto’s atmosphere and accelerate as they stream away in the solar wind. PEPSSI will determine the composition as well as the densities of these ions; this will help us pin down Pluto’s atmospheric composition and escape rate. SWAP, for Solar Wind Around Pluto, performs a clever measurement of Pluto’s total atmospheric escape rate. How? At some distance from Pluto, the atmospheric escape pressure balances with the incoming solar wind pressure – and the distance at which this occurs from Pluto reveals the rate of Pluto’s atmospheric escape. SWAP’s job is to accurately measure that distance by determining where the solar wind cuts off and Pluto’s atmosphere begins. 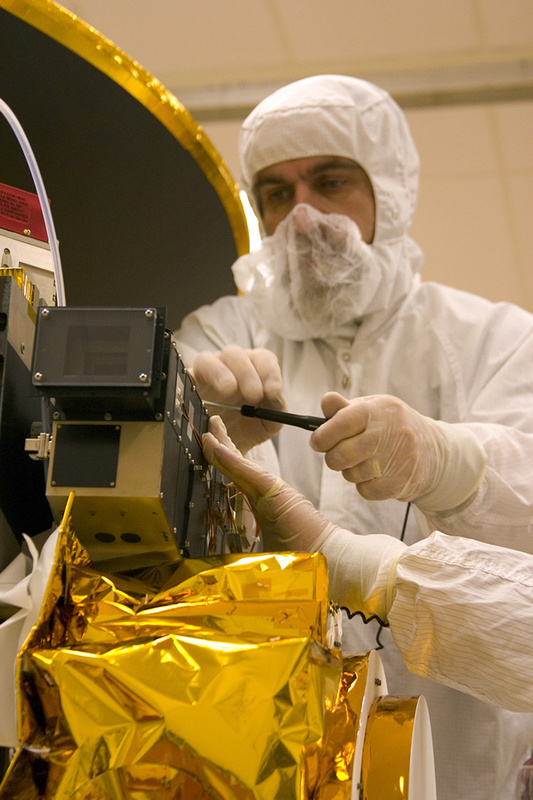 LORRI (our Long Range Reconnaissance Imager) and Ralph are primarily surface imagers – not atmospheric instruments – but they can shed light on Pluto’s atmosphere by searching for clouds and hazes, both as New Horizons approaches and recedes. In fact, LORRI and Ralph could, in principle, make the first atmospheric detections of Pluto by New Horizons by capturing images of just such phenomena, perhaps even weeks before REX, Alice, PEPSSI and SWAP conduct their investigations. As you can see, we have a wide variety of ways to plumb Pluto’s atmosphere and search for one around Charon. The fun begins in May, and intensifies across June and July. Stay tuned – soon I won’t be talking about plans, I’ll be able to write about results! As I close, I know you know that this is our last January before reaching our long-sought objective of reconnoitering Pluto and its system of moons. But what you may not know is that January is a very special month for the New Horizons team: We launched in January, our science team meets to plan ahead every January, and January is also when Clyde Tombaugh took the images of Gemini that initiated his discovery of Pluto. So hail to January, and also to this July when our explorations culminate — just around the bend! That’s it for now, but until I write again, I hope you’ll keep exploring—just as we do.